Is it Friday? Again? Sometimes these weeks just get away from me! I have been spending most of my free time working on a very large not really sewing project. I say “not really” because it doesn’t involve sewing exactly, but it is going to change the way I sew….. sounds cryptic, doesn’t it! It should be all done and ready to share in a few weeks. This week I stumbled upon this blog post and decided that I had to do something to help her out. (I’m adding this to Sew&Tell at Amy’s.) I’ve never sewn any triangles before, or followed a quilting pattern before, but I have plenty of scraps and even if it’s not perfect (which it’s not…. more about that in a minute) at least I can make a few blocks and learn something in the process. I started with four blocks, and the first two require a lot of unpicking…. so they are in a heap under the dining room table and I am just going to pretend that it never happened. So sewing didn’t really fit into the plan this week, but shopping did! Last night I went to an afterhours party at this cute little store. For a few weeks now they have had a deal going on where you earn auction bucks for every dollar you spend. You spend $10, you get $10 in auction bucks. Last night they had the actual auction and you used all those auction bucks they gave you for free to buy real stuff in a silent auction. It was a party I tell you! They were auctioning off fabric bits and bobs, patterns, fat quarter bundles, scrap bags and kits and sample quilts that have been hanging in the shop for a while. I didn’t have enough auction bucks to get a kit or a quilt or any of the larger bundles of fabric, but I did get a bunch of things that I think are cool. And even cooler because they didn’t cost me a cent. There isn’t much better than free! Here are my winnings. I’m not sure what I am going to do with all of it, but I am excited to find out! 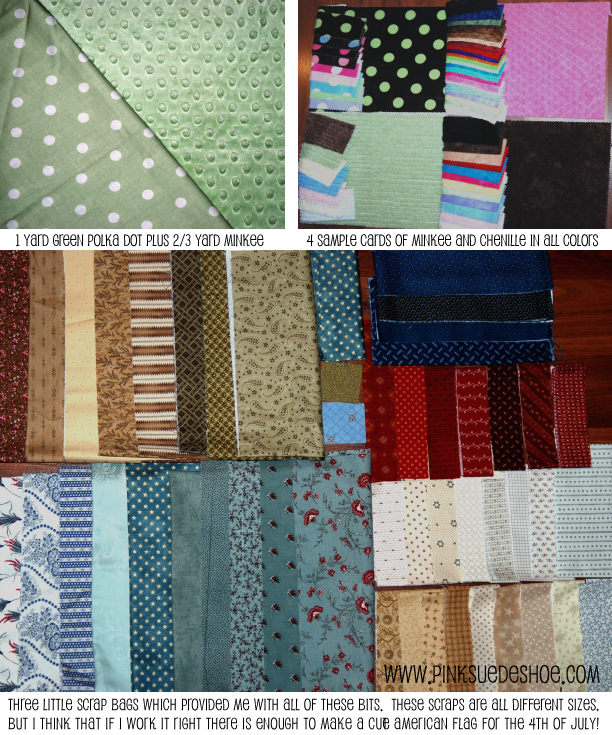 The green polkadot and minkee is already earmarked, and I think I’m going to use the minkee and samples in some sort of quiet book for Creamie. I don’t know, we’ll see! And as if that wasn’t enough cool free stuff for one day, on the way home I stopped by Walmart to grab a few things and I happened upon a clearance section where I found these baskets. They also had a lime green one, which was priced at $2 (originally 12). These brown/black baskets didn’t have a price on them, so i threw them in the cart and found an employee to check the price for me. If they were $12 I didn’t want them, but $2 would be a steal, right! Amazingly I found an employee after 8:00 pm that could help me find a price. Do you want to know what it was? Do you want to guess? You’ll never in a million years get it! These little beauties rang up at $.02 each. Two cents each, two pennies a piece! AMAZING. That’s right folks, I paid six cents total. I worked in retail for a long time while I was in school and I know that sometimes at big companies computers and people join forces to make accidental mistakes that happen to be in the customers favor. And when that happens you don’t apologize or try to make it right, or pay a “fair” price. You just snap it up as soon as possible before anyone at corporate figures it out. One day I’ll do a post dedicated to the nearly free items in my house that I owe to the computers and/or people in corporate America. Man, I love free. You always were the best at getting things for almost free… I’m jealous of your baskets! 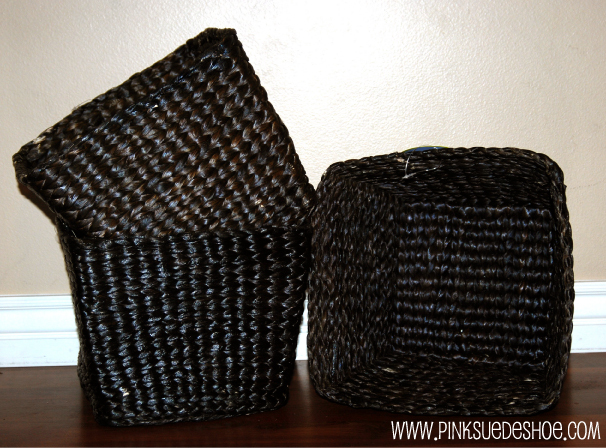 you shouldn’t have told us about those baskets…I’m so jealous over here!! Your blocks are perfect. I love house blocks. It looks like you got some great deals on fabric! How fun!! I love the house blocks! Doesn’t everyone love a deal? Those house blocks are too cute! And I love free/nearly-free stuff too 🙂 There’s nothing like getting a good deal! Thanks for the link on the house blocks. I may just try to do that. That auction sounds like fun! You got some good deals. Great houses. 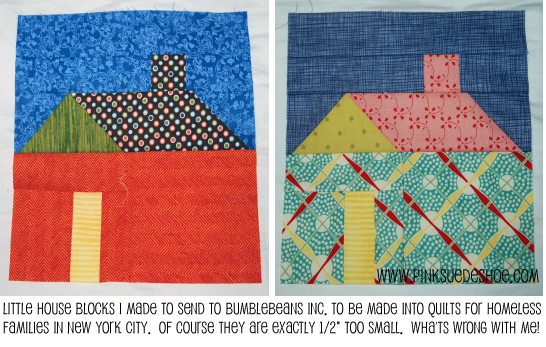 I have a house quilt on my one day list. What a luckybargain shopper you have been. Great fabrics and baskets. $0.02 – just ridiculous. I can’t believe you found something so cheap. Your house blocks turned out great. I had the same problem with the first ones I made as well. I am sure V will be thrilled with them. Thanks for sharing!